Whether you’re looking to install fencing to add privacy, security, or curb appeal to your home, you have many options to choose from. Whether you’re looking to install fencing to add privacy, security, or curb appeal to your home, you have many options to choose from. The right fencing can reflect your style, tie together an outdoor space, and add character to your home. When choosing fences for your home, consider your privacy and security needs, as well as the architecture of your home and style of your landscaping, to ensure you will have a beautiful and functional fence for years to come. Here are the benefits of 4 types of fencing to consider for your own fence installation. Wooden fences are one of the most classic options. 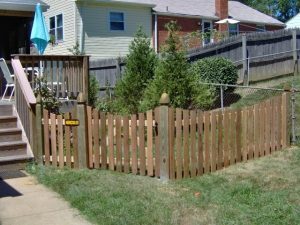 Wooden fencing is available in a wide variety of heights, styles, colors, and finishes, making them a great option for just about any home’s style. Plus, they have some great hidden benefits like noise and wind reduction. Wood fences require consistent maintenance to prevent mold and warping, however, so be sure to consider this when weighing your fencing options. Wrought iron fencing is extremely stylish, and can be a beautiful option to complement your garden or hardscaping. This fencing tends to look timeless and ornate, which can help you increase curb appeal by tying together a classy, classic look for your home. Maintenance for wrought iron fencing includes rust removal and seasonal cleaning, but they also come in a wide variety of sizes and styles so that you can pick the perfect elegant fencing for all your home’s needs. Vinyl fencing is extremely popular recently, due to the low maintenance and high durability of vinyl. Plus, vinyl can be found in any number of colors, picket and panel shapes, and heights, to suit any style or privacy needs you may have. They tend to have a slightly higher price point than wood, but vinyl fences are a long-term investment that can keep your home looking beautiful for years. Stone is the perfect option for anyone looking for a rustic, natural look outside their home. This fencing requires little maintenance and perfectly complements hardscaping features and lush, charming gardens. These are also some of the most private fences, allowing for a tranquil outdoor patio space.